Automatic Double Head Bottle Filling Machine Used To Fill Liquid In The Bottle And Applicable In Range Of Industries Like Pharmaceutical, Food , Beverages , Pesticide Industries. S.S. Top, covers, conveyor guides and other parts for longer life. 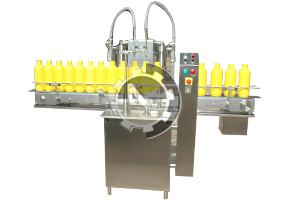 NKLFL-50, Automatic Double Head Bottle Filling Machine is a compact model used for filling of plastic and glass containers. An imported fiber optic sensor senses the Bottle and then gives the order to syringe system to fill the bottle as per required dosing.